The Star Wars Underworld has been invited by Hasbro to take part in their annual fan choice poll to choose the next Hasbro Black Series 6" Star Wars action figure. SWU readers have the opportunity to let us know what characters you would like to see made as part of the line and we will send the top six choices onto Hasbro. 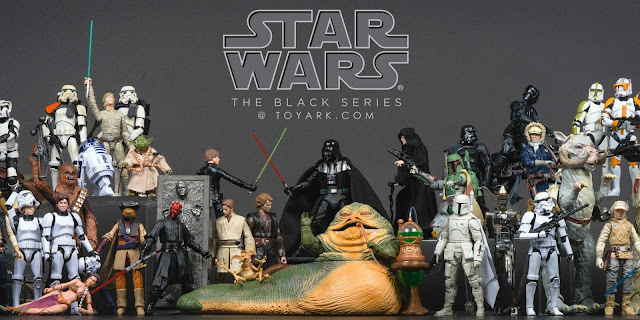 Once Hasbro has that data, as well as data collected from our colleagues at other top Star Wars fansites, a poll will be held on StarWars.com to choose the character who will be made as part of The Black Series next year. The winner will be announced during Hasbro's Star Wars panel at San Diego Comic Con. To vote, comment on this story or on our Facebook Page telling us what figure you would like to see. Voting closes at 12pm PST on Sunday July, 10th. Be specific when you vote. If you want a character in a specific costume, make sure to note it. For example, if you want a figure of Rey in her costume from the end of The Force Awakens then comment with "Rey (Jedi)". Cast your vote in the comments and May the Force be with you! Follow The Star Wars Underworld on Twitter @TheSWU for more updates about this story and other breaking Star Wars news. Gotta go with FORCE AWAKENS Luke. Clone Wars Sheev Palpatine/Darth Sidious with Interchangeable Head & 2 Lightsabers. Starkiller, of The Force Unleashed. Qui Gon Jin. ...please! Why aren't people wanting him? Coolest Jedi ever!! Um, that has been released already. A-Wing Pilot. Any of them. Jake Farrell, Arvel Crynyd, Sila Kott. I can dream, meatbags! I can dream! Jaina and Jacen Solo from "Legacy of the Force"
Satine Kryze in burgundy dress and cloak from Duchess of Mandalore with deactivator. Kylo Ren with a removable helmet/head showing his scared face at the end of the force awakens. My second choice would be the snow trooper from force awakens. Abeloth from the Fate of the Jedi series. Who wouldn't love to see that, guys? If I had to pick for the current polls, Jaina Solo or Galen Marek (Starkiller). But really would like Siri Tachi, she deserves more attention. I like Hera Syndulla---plus she doesn't get a whole lot of merch anyway. Then Cham Syndulla from the Clone Wars model would be cool too! And then Garazeb Orrelios would be interesting. Lobot. Don't know if he has already been done. (Phase 2) ARC trooper Fives!!!!! Or Rex! Darth Revan! Please Darth Revan! Darth Revan! Please, Darth Revan! For the love of the Force, both Light Side and Dark, please Darth Revan! GALEN MAREK!! MY POOR SWEET BB NEEDS A DECENT FIGURE! galen marek! my poor sweet bb needs a black series fig! A Star Wars site by the fans, for the fans. This site is not endorsed by Lucasfilm Ltd. or Disney and is intended for entertainment and information purposes only. The official Star Wars site can be found at www.starwars.com. Star Wars, the Star Wars logo, all names and pictures of Star Wars characters, vehicles and any other Star Wars related items are registered trademarks and/or copyrights of Lucasfilm Ltd., or their respective trademark and copyright holders. All original content of this site, both graphical and textual, is the intellectual property of The Star Wars Underworld - unless otherwise indicated.